Only Fools And Horses was written by John Sullivan, who also wrote programmes like Citizen Smith and Just Good Friends, The series was first transmitted in 1981 and follows the exploits of the Trot ter family who live in a council owned high rise block of flats in Peckham in The London Borough of Southwark. The series officially ended in February 1991, but did return in December 1991 with seven Christmas specials. Three more episodes are to being filmed currently, the first episode was shown in the UK on Christmas Day 2001 and the other two to be shown in 2002. 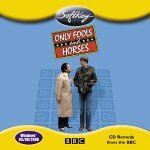 This page is a tribute to the late John Sullivan's excellent Only Fools and Horses. This page includes a detailed episode guide with descriptions of each episode along with pictures and sounds, also a gallery of pictures and small sound bytes, details of the cast and details of when OFAH can next be seen on TV and much, much, more. To access all this just click the icons shown on the menu bar at the top of the screen. Have you any suggestions for this site, Why not tell me? I would like to say a special thanks to Ian Butler for re-designing my menu bar!